Our Forest Of Frogs summer camp ran from August 21st – 25th, 2017. With more than 50 children coming each day, we had a busy week. Younger children (aged 6-12) engaged in drama and music activities, forest school, and nature art and craft. Teenagers (12-19) put their minds to a production of Romeo and Juliet. In between the rehearsals, they still had time to enjoy some camp fires, wood caring, and learned the tango! By Friday afternoon they were presenting an amazing performance first to the younger children, and later to their friends and parents. Many thanks to Marking Rawlings and Elizabeth Keates who adapted the script, cast and directed the production so professionally. The collaboration with Box of Frogs Theatre Academy (https://www.facebook.com/Box-of-Frogs-Theatre-Academy-109053859244862/) will continue. W’ll be up and running again next year – Dates provisionally set for Aug 20th-24th, 2018. As ever, in the beautiful gardens of St. Paul’s Walden Bury. June 11th proved to have perfect weather for our Open Farm Sunday at East Hall Farm. Our even ran alongside a National Garden Open Scheme event at St. Paul’s Walden Bury, so that visitors to the gardens could stop by to learn about food production, farming and the countryside, and taste ice-cream made by a local dairy farmer, and our visitors could go onto enjoy the gardens, and tea and cakes offered by the local parish church. Several farmers and organisations came together to provide an interesting range of displays. 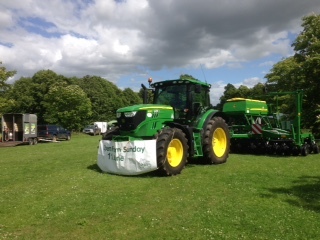 The Patemans joined us from Burleigh Farm, Knebworth, with a fantastic display about soils, and also arranged that a John Deere tractor and no-till drill were on display. Within the Walls, a care-farming project, was represented and provided nature art and craft activities for children to complete. 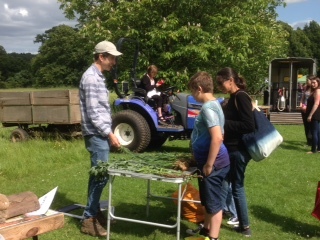 From East Hall Farm we had information about the nature conservation work we do as part of our higher level scheme agreement, and also the crops we grow, as well as a small tractor which lots of children enjoyed sitting on. We also had tractor-trailer rides around the farm, showing our mob-grazing of Hereford and Sussex cattle, crops, field margins and conservation work. A steady flow of visitors enabled us to host about 250 people over the course of the afternoon, without there every being a queue for the tractor-trailer rides. Many thanks to all those who completed visitor feedback forms, which allow us to plan for future years. The tractor-trailer rides proved the most popular offering. It would seem that most of our visitors had not been to an open farm Sunday before, and for some, it was their first visit to a farm. We were pleased to hear that so many people rated the event good and excellent , and that almost all claimed they had learned something new about farming during their visit. Particularly pleasing was visitor’s growing appreciation of farmers’ role in managing the environment. Open Farm Sunday 2018 will be on June 10th, so if you missed us this year, or would like to return again next year, note the date. Lots of farms open there doors at Open Farm Sunday, so you would always try another farm as well. Last year we added a new feature to our Forest of Frogs summer camp. Working with Elizabeth Keates, we offered a week of more drama based activities for teenagers. The teenagers were cast in a shortened version of “A midsummer night’s dream”, and during the week they chose a venue in the gardens to be their stage, practised their lines, choreographed their movements, and made their costumes. Teenagers less interested in a full acting role played a part too – developing props, composing music etc. On the final Friday afternoon, they were able to perform their play to an audience of parents and friends, who were treated to a tour of the garden as they followed the troupe through the acts of the play. Of course, they still wanted to enjoy some of the traditional forest of frogs activities, so they were still able to enjoy campfires, build dens, and do some nature art as well. Following the success of last year, we plan to do another drama workshop for teenagers. The play will depend on the number of people who enrol, as we want to be sure to take on something which suits those coming. Please see the poster or contact Sarah Cash, sarahcashbofts@btinternet.com to find out more, and book your place. I’ve just returned from Bhutan, the small Himalayan kingdom renowned for its pursuit of gross national happiness (GNH) instead of gross domestic product (GDP). While there, I attended the international conference on GNH, a meeting of hundreds of academics and practitioners all interested in different aspects of GNH, from economic models to promoting the values of GNH. All policies are screened against these four pillars. GNH is pursued through activities across 9 domains, relating to psychological wellbeing, health, living standards, ecological diversity and resilience, good governance, cultural diversity and resilience, community vitality, education, and time use. I argued that learning about personal and social development, and engagement and valuing nature, complement the GNH values which are to be embedded in teaching within Bhutanese schools. Outdoor learning will not, in itself, support teaching of all GNH values, but can go a significant way towards teaching in this area. Further, the move to outdoor learning could be an enjoyable change for schools which have taken a fairly formal, traditional approach to learning. The move outdoors can be stimulating as it releases children from the constraints of the 4 walls of the classroom, and the tules for behaviour in the classroom. Outdoor settings provide freedoms: to move, to be noisier, to interact more, which can be a real relief for students who find sitting still or have ADHD. (These ideas are explored further in a paper I am writing at the moment). A new ‘Green schools for a green Bhutan’ programme is supporting a transition to new learning styles. I was fortunate to be able to visit several schools, and do some work with pupils. I made films for the ‘Royal Tutorial Project’ on plant growth, management of soil fertility and valuing biodiversity. These films, aimed at 13-16 year olds and the general public, are aired on a Sunday evenings on TV, by the Bhutan Broadcasting Service. A fourth film, showcasing some very successful examples of outdoor learning in schools will, I hope, encourage more teachers to take their children outside. This week marks the launch of Countryside Classroom, a website which promotes learning about food, farming and the natural environment. The Natural Environment: providing teachers and parents with ideas, knowledge and skills to get children outdoors to explore our natural environment whether it be through forest school or outdoor science lessons orienteering or just recognizing common plants and animals. Outdoor Learning Experiences has been a part of the development of Countryside Classroom, as a member of the core committee of organisations which worked towards its development and launch. However countryside classroom has only been possible due to the many organisations that have offered learning materials, venues or expertise to ensure that wherever you are located in England, and whatever you want to do, Countryside Classroom has ideas and resources to support you. Its free, its open to all. Have a look! As the school year comes to an end we have enjoyed a wide range of groups at Outdoor Learning Experiences. Reception and year one children have enjoyed a series of forest school sessions; older children have also enjoyed forest school, including some simple wood carving and campfire cooking. There have also been farm tours, and some orienteering and map reading session. There will be a short lull for the school holidays, and then the summer camp will run from August 24th – 28th. Our “forest of frogs summer camp” brings together forest school activities, nature art and craft, and the skills of box of frogs theatre school, to provide a fantastic week at the end of the school holidays. The whole takes place in the wonderful setting of the gardens at St. Paul’s Walden Bury (see stpaulswaldenbury.co.uk), where the children can run and play, develop characters and plot lines, and chose to stage their plays in different areas of the garden. They also go on treasure hunts and develop their map reading skills. Nature art and craft is a big part of it, as they make the most of the willow to weave and build, and use clay and leaves and flowers for lots of nature art and craft. Of course, there is also some forest for camp fires, den making, and toasting marshmallows. There are still a few spaces left, so it you would like to book for the whole week or just a day or two, please contact sarahcashbofts@btinternet.com or call 07973818254. For further info see the “Forest of Frogs” web page under the “Annual events” tab. Summer is the high season for outdoor learning. We are now fully booked with forest school, farm visits, and some interesting orienteering activities all lined up for a range of schools between now and the end of the summer term. 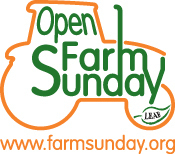 In addition, Open Farm Sunday will take place on June 7th. From 2:30-5:00 will be offering free farm tours, which give you the opportunity to find out more about the fields, woods and livestock at East Hall Farm. You can also find out more about our cows, and the beef we sell. Farm Sunday runs alongside the opening of the gardens at St. Paul’s Walden Bury. The Farm tours are free, whereas entry to the gardens (and access to the delicious tea and cakes) has the normal charge, all of which goes to charity (see www.stpaulswaldenbury.co.uk for further details). In August, we are running the Forest of Frogs summer camp, from Aug 24-28th. The week brings together Forest School and Box of Frogs Theatre School. We will be combining elements of each to provide an interesting but unique summer camp experience which will include forest school activities, drama workshops, and nature art and craft, suitable for children aged 6-13. It will take place in the gardens of St. Paul’s Walden Bury. Orienteering, camp fires, music, drama, art and craft. Opportunities abound for fun and inspiration! To book for individual days or the full week contact sarahcashbofts@btinternet.com. The bluebell woods are coming into flower, and with the warmer weather there is a renewed interest in outdoor learning. If you haven’t had the courage to bring a group of school children to a farm or to forest school, have a go this term. I am happy to offer a farm visit which includes a “taster” of forest school, if you would like to give it a try without committing to a series of sessions. On June 8th Outdoor Learning Experiences is offering farm tours of East Hall Farm as part of Open Farm Sunday. Meet at St. Paul’s Walden Bury, where the gardens will also be open. Open Farm Sunday is free, but if you enter the gardens (for which a charge applies) there will also be teas and home made cakes for sale. In addition to June 8th, the gardens at St. Paul’s Walden Bury are also open to the public as part of the national gardens scheme on April 13th, May 11th. Farm Sunday has expanded to offer a wider season of educational visits for schools. Open Farm School Days runs from June 2-13th, and aims to encourage schools to come and visit farms. This is a great time to see a range of crops as they mature, as well as farm animals (including our calves). Looking further ahead, we are planning something new this summer. Outdoor Learning Experiences is teaming up with Box of Frogs Theatre School to offer a summer day camp for children ages 6-12. Activities will include drama, music, nature art and craft, and of course, forest school. The camp will run August 12-15th, and 19-22nd. Further details will be posted shortly. When the temperatures drop and the days are shorter the whole farm slows down. However that does not mean there is nothing to do. For one thing, the cows are brought in, and need feeding daily. Furthermore, there are many jobs to do which are more suited to the cooler weather. Woodland management becomes a key feature, and in particular, hedgerows. We have kilometres of hedgerows that need cutting to keep in shape.We also have newly planted hedgerows that need laying -a traditional country craft that ensures that hedges grow more thickly, and provide a denser barrier between fields. Hedges also provide habitats for wildlife, whether it is nesting birds or small mammals, and are long habitat corridors along which wildlife can travel in relative safety. We are fortunate to have a highly skilled hedge layer (Donato Cinicolo) coming to St. Paul’s Walden twice. His first visit will be an informal talk about hedge laying, to be held at the Strathmore Arms pub on Jan 14th (7:00 for 7:30). He will then return to the farm on Feb 8th to run a hedge laying course. If you would like to learn this traditional country craft, please contact me. The day-long, hands-on course costs £60 and includes a hot lunch indoors. The winter is also a key time for planting shrubs and trees. As part of our HLS agreement, we will be planting traditional fruit varieties in part of the walled kitchen garden: apples, pears, cherries and green gauges. I already have several schools booking in for forest school or farm visit in the spring and summer. If you would like to bring a group please contact me to secure your place. The weather is just beginning to turn cooler, and some schools are already e-mailing in to secure their dates for Forest School. Personally I think Forest School is best in the autumn, when there are so many colours in the woods, and leaves, acorns and beech nuts provide lots of materials for art and craft activities. There are still opportunities for schools to come for Forest School sessions. Another popular activity is to come and visit the walled kitchen garden, which is full of blackberries, plums, grapes and many varieties of apples and pears, as well as being the site of vegetable growing for a box scheme. Schools can link this to harvest festival, or just allow children the chance to taste fruit as they pick it straight off the tree. Autumn is also the time for my favourite event, Art in the Woods, which will take place on October 13th in Hitch Wood (2-4 pm). Further details on the web site. This event is always enjoyable. A clearing in the wood becomes the site for range of creative activities using natural materials. Hot drinks and cakes are sold by Emily’s tea shop, so that whatever the weather adults and children can keep warm and fed. Parents are generally amazed at how engrossed children can be, and its even better when the parents become engrossed too! Several local artists come together, and for the past few years there has been a communal sculpture which everyone can contribute to, and at the end of the afternoon it is hung in the trees, for walkers to enjoy in the weeks to come. 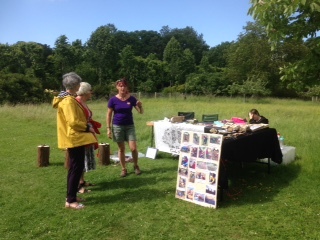 This is also a great opportunity to check out the forest school site, and get a taste of what forest school has to offer. Our Forest of Frogs summer camp was a great success. Over two weeks from mid – late August, children aged 6-12 came to the gardens of St. Paul’s Walden Bury for a mixture of forest school, nature art and craft, and drama workshops. Each week we started working with the children to identify characters and draft a plot, which was then turned into scenes. Script were written and dance routines choreographed over the course of the week. Children also enjoyed map reading, camp fires, smores (toasted marshmallows sandwiched between biscuits), and lots of creative work with clay and natural materials. 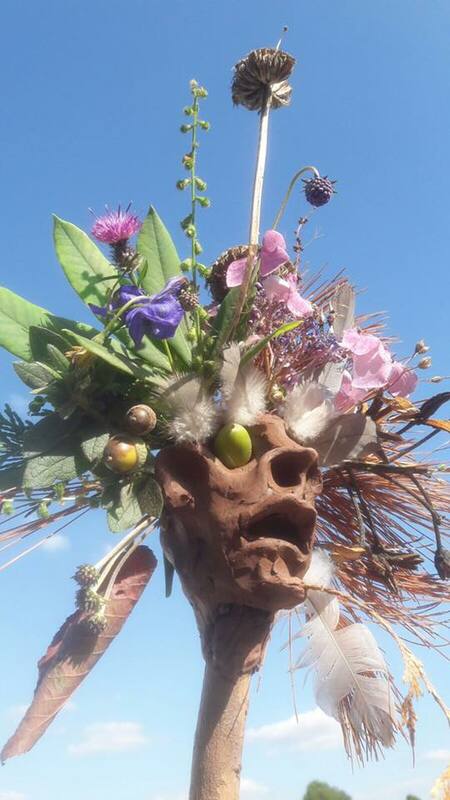 We used the resources from the garden to make props, including some beautiful headresses and crowns made from woven willow, flowers and leaves. Each week ended with a fantastic afternoon of theatre, as both the younger (aged 6-8) and older (aged9-12) children put on their shows. The plays were staged in different parts of the garden. The children really enjoyed it, and some are already urging their parents to book for next year. After the success of this year, there will definitely be a summer camp next year: we will post dates and photos soon. This summer we are offering a new summer camp experience, bring together Forest School activities with theatre classes. Forest of Frogs summer camp brings together our experience leading outdoor learning, and the experience of Box of Frogs Theatre School run by Lou Davidson. We will be combining elements of each to provide an interesting but unique summer camp experience which will include forest school activities, drama workshops, and nature art and craft. Children will enjoy the grade 1 listed gardens of St. Paul’s Walden Bury which provides a natural environment in which to be inspired to write plays, create props using natural materials, and engage in games and activities which allow them to explore and develop their understanding of nature. Orienteering, camp fires, music, drama, art and craft.. Opportunities abound for fun and inspiration! The camp will be taking place in August. Book for Aug 12th-15th, and / or August 19th-22nd. The camp is open to children aged 6-12, and will run from 10 am- 4 pm, with breakfast and aftercare available if you need to stretch the day from 9 am – 5 pm. The cost is £160 for 4 days, but those booking before June 30th can receive an early bird discount to reduce the cost to £140 for 4 days. All bookings must be made through Sarah Cash at Box of Frogs Theatre School, email sarahcashbofts@btinternet.com, or call Sarah Cash on 07971 163880. 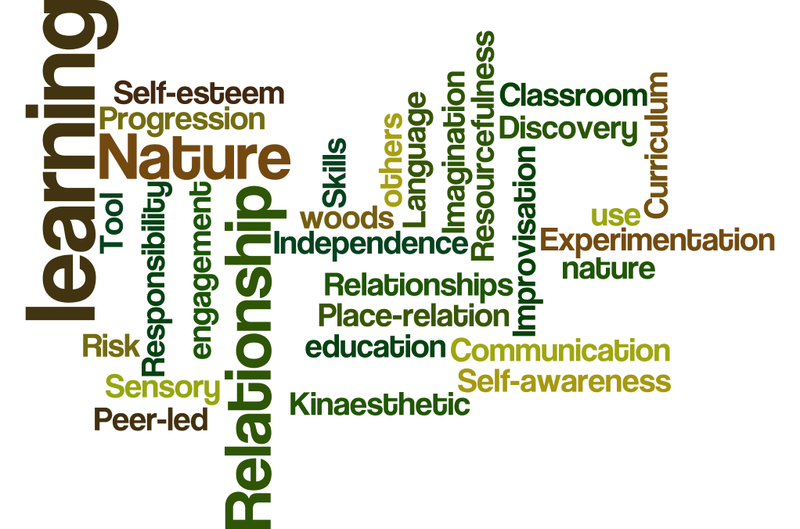 Why Outdoor Learning Experiences? Well, everything we do is outdoors. Children spend most of their time at school indoors, but sometimes there’s s a real benefit in moving outside the classroom, away from the same desks and tables, and learning in a different way. Learning can involve using all our senses, listening, feeling, smelling, seeing, touching, and even sometimes tasting. I have heard some teachers claim that quite a lot of the primary school curriculum could be taught out of doors. While I am not sure I would go that far, I do think that much more can be taught outdoors than is done so. So much of science and geography lends itself to outdoor teaching, and aspects of history can be taught outdoors too. It’s about exploring the world and discovering what is out there. Outdoor learning makes things more relevant, and breaks down the separation between “book learning” and “real world learning”. Learning outdoors, in the natural environment, makes learning a more memorable experience. Learners experience the weather, whether it is sunshine on their faces, or a memorable rain storm. They smell the aromas, feel the textures of things such as leaves, bark or mud, in their fingers or beneath their feet. They run up or down hills, experience the darkness of the woods and the brightness of the sunshine. Outdoor learning is not separate from indoor learning: they are linked. Outdoor learning can develop a wider vocabulary, and be the topic of new writing back in the classroom. Visiting a farm or allotment at harvest time can contribute to RE teaching at Harvest festival. 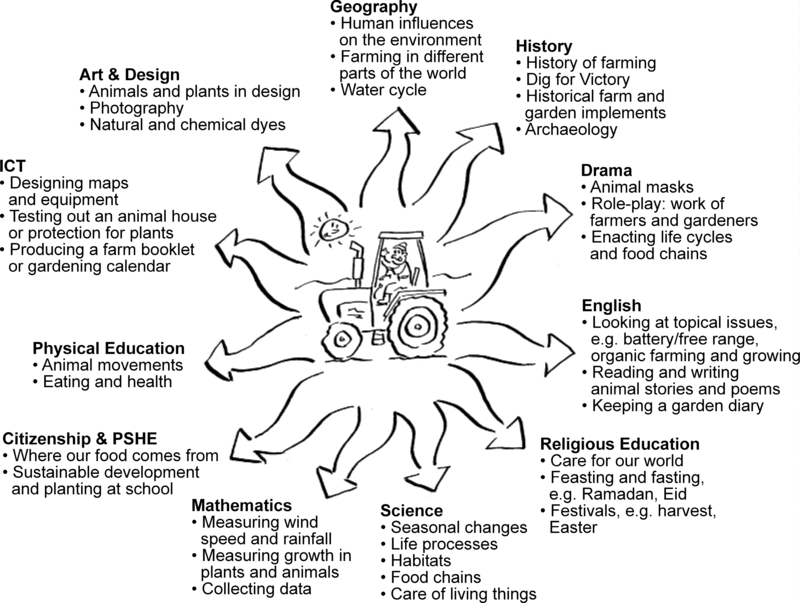 FACE (farming and countryside education) sums this up in a fantastic diagram which depicts all the topics surrounding a tractor, and can be seen among the images appearing on the educational visits page. Outdoor learning also allows children to develop “soft skills” alongside curriculum topics, outdoors. So team working, overcoming challenges, assessing risk, developing social skills – all these can also be enhanced with learning outdoors. Take your children outdoors to experience a new way of learning! Welcome to outdoor learning experiences, a web site which brings together outdoor learning practice and research. This site covers a range of themes from forest school , farm education, science field trips, to current debates and research about learning in the natural environment. Feel free to pick up on the strands that interest you most. This year Open Farm Sunday will take place on June 8th, and we will be offering farm walks alongside the gardens of St. Paul’s Walden Bury, which will be open to the public for charity on the same day. So drop in for gardens, tea and cakes by the WI, and to learn more about farming. Later in the summer, we are hosting a summer camp. Forest of Frogs summer camp brings together our experience leading outdoor learning, and the experience of Box of Frogs Theatre School run by Lou Davidson. We will be combining elements of each to provide an interesting but unique summer camp experience which will include forest school activities, drama workshops, and nature art and craft. Children will enjoy the grade 1 listed gardens of St. Paul’s Walden Bury which provides a natural environment in which to be inspired to write plays, create props using natural materials, and engage in games and activities which allow them to explore and develop their understanding of nature. Orienteering, camp fires, music, drama, art and craft.. Opportunities abound for fun and inspiration! The camp will be taking place in August. Book for Aug 12th-15th, and / or August 19th-22nd. The camp is open to children aged 6-12, and will run from 10 am- 4 pm, with breakfast and aftercare available if you need to stretch the day from 9 am – 5 pm. The cost is £160 for 4 days, but those booking before May 30th can receive an early bird discount to reduce the cost to £140 for 4 days. All bookings must be made through Sarah Cash at Box of Frogs Theatre School, email sarahcashbofts@btinternet.com, or call Sarah Cash on 07971 163880.